Name of this application are quite simple and reflects its function. 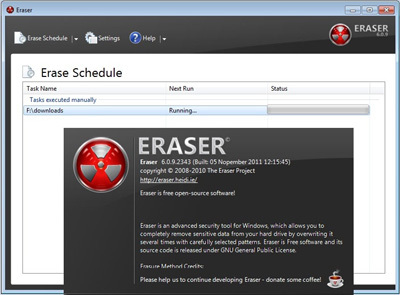 Eraser itself is an application that permanently deletes the data on your PC either in the form files and folders. If you delete a file through Windows Delete command, the actual files are still stored on the hard disk. Although the Recycle Bin has been cleaned, deleted files may still be returned in full using third party applications. Well, Eraser will help you permanently delete data so it can not be restored again later. In theory, Eraser will remove repetitive data using the selected pattern to make sure it can not be returned. Removal uses technology that has been developed and used in accordance with recognized standards. The user can select the desired deletion method using several methods in the Erase Settings. There are options ranging from the simple to the extreme elimination. Here will appear removal method which consists of 14 types. By default, the choice fell on the method of Gutmann (35 passes) that are powerful enough to erase important data. In short, this method enables users to delete important data from your hard disk using the elimination pattern developed by Peter Gutmann. The trick, it will overwrite files that have been deleted many times (35 times). Next, we must determine what to do with creating the event (task) into the new Erase Schedule option. How, we simply right clicking and selecting New Task. Here you can specify a file/folder what to delete. This removal option include manually (Run Manually), direct (Run Immediately), after the system is restarted (Run on restart), or repeatedly (recurring). Please click the Add Data to enter the desired data. Click OK. So the task was going to appear there. To run it, right click on the intended task and select Run Now. Eraser can be a solution for those who care about the importance of data and do not want the data used by unauthorized persons. This is useful for example if you want to sell the hard disk or the computer that stores the necessary data personally or office. Plus: a variety of deletion methods and options; supports all types of storage media. Minus: There is no Undo option.